If you’re into pure classic Heavy Metal, there was no other place for you to be tonight, than Fuzz Club. 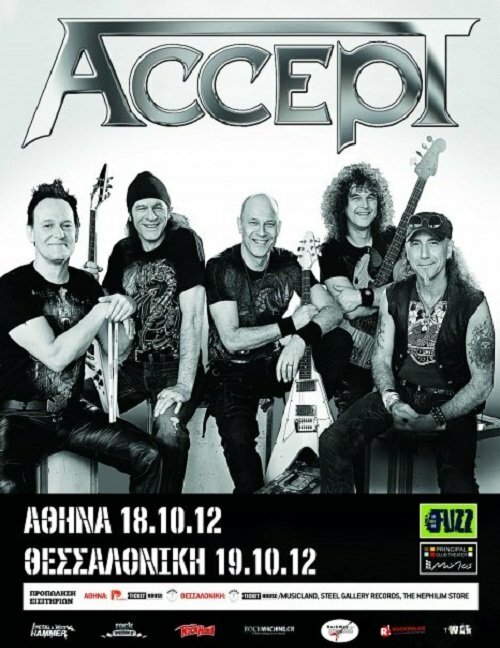 The almighty Accept were once again visiting Greece to deliver the goods, this time supported by one of the best Heavy Metal bands that Greece has to offer, Marauder. I didn’t have the chance to see them the last time they visited Greece with their new singer Mark Tornillo, so I was really looking forward to see him on stage. The night didn’t start very well though, due to the fact that the doors were about to open at 19.30 which didn’t happen until one hour later. Oh well, a few more beers for us “thirsty” ones! The line of people started filling up the club until it was half-full and Marauder came on stage. Sadly most of the crowd didn’t seem very familiar with the Marauder stuff, although a lot of people in the front rows were singing along. The band played 8 songs, some old and some from their new great record –check it out- with a mediocre sound, but an excellent performance. It was a very special case because despite the fact that the founder/guitarist of the band George had his birthday that night and that they were supporting Accept, the legendary singer Tony Martin was there to watch both bands play. During the last few songs, the crowd looked a lot more active and warmed up. The band finished their set and a big applause followed. A small break, lights down, crowd cheering. Accept was about to hit the stage, hard. They started out playing a couple of songs from their new “child” Stalingrad. You could tell right from the beginning that the sound wasn’t in any case their ally. The vocals were way too low, although Mark was giving his best self, and the guitar and bass were very high. I’ve said it before, but sadly in half the gigs that take place in Fuzz Club, the sound isn’t exactly crystal clear, but more like a mess of electricity and buzz in places. Anyway, the band continued with some of their classics and the crowd –which has doubled until then- didn’t seem to mind so much about the sound quality. I haven’t checked live setlists from the band, I’m a fan so I didn’t have to learn the songs or something, but Monsterman did come as a nice surprise. I think that people didn’t like Accept records like Russian Roulette but mostly their 80s classic stuff. The song that followed was Shadow Soldiers and at that point you could see that the band was tighter than ever. I’ve seen them with UDO as well, and I’m a big fan of UDO in both his Accept and solo career, but I didn’t enjoy their performance with UDO as much as I enjoyed this one with Mark. He’s definitely way more than just “a good replacement”! This is was the part where the Accept classics started to tear us up, with the highlight of all of them being the song Aiming High. A few more sons from Blood of the Nations, and the band left the stage for a few minutes. The encore was more than great. Metal Heart, the bands anthem and generally, a Heavy Metal anthem as far as I’m concerned, Teutonic Terror, their smash hit single from Blood of the Nations and Balls To The Wall ended the bands show. I don’t think that there was anyone who left with bad memories from that gig, a real Heavy Metal concert, a true and full Accept show in every sense of the word. Mark is more than great, Stefan and Herman are metal machines and Peter and Wolf are like one on stage. I believe that today’s classic Heavy Metal scene, really fails to offer the kind of on and off stage quality that bands like Accept have set the standards for. Cheers to Alice from Ruthless Steel for the company and photos, Alexis from Hurlement -come back soon brother- , Andreas Andreou for the beer and the hookup with T.M., Tony Martin -for just being there-, Dimitris Tsouanas for the photos with Accept, the guys from Battleroar, Greg from Eat Metal, Nikos Mac, Antonis Souvatzis, and last but not least, the 2 dudes I always like to tease, Mitsos “Swordmaster” and Leonidas “Spartan” -they know why-.